Balinese culture is unique and impossible to fully capture in the few days we were in Bali, Indonesia. Balinese society is strongly influenced by Indian Chinese, and Hindu culture. This spiritual combination can be seen in the photo compilation below, is a snapshot of the cultural society that we were able to experience between March 12-14. The photos include a traditional Balinese home, religious diversity, art and design, rice irrigation fields, biodiversity on the island, and ceremonial dance. Our group had the opportunity to visit a traditional Balinese home, with grand entryways and multiple outdoor rooms spread out in one family compound. Buildings cannot be taller than a coconut tree, so rooms were spread out rather than built high. A traditional Balinese home consists of a collection of structures within an enclosed area, including bedrooms, guest rooms, a family shrine, living areas, and a kitchen space. The spaces, design, and purpose of each building directly relates to a spiritual meaning in a feng shui manner. For example, Balinese people follow Tri Hita Karana – the concept of harmony and balance of three elements: human, nature, and gods. This particular traditional Balinese home is located in Ubud. The woman in the photo is sitting at the main bedroom situated in the middle of the complex, weaving together small containers to hold prayer offerings. Indonesia is known for its Muslim majority, but that is not the case in Bali. About 85% of the people are Balinese Hindus; 12% are Muslim; and about 3% are Christian. Balinese Hinduism is a combination of local Bali beliefs, Indian Hinduism, and Buddhism. This religion consists of gods and demigods who are worshipped together with Buddhist heroes, the spirits of ancestors, indigenous agricultural deities, and sacred places. Bali has an estimated 20,000 puras (temples) and shrines, and is therefore known as the “Island of Thousand Puras” (“Islands of the Gods”). Balinese Hinduism focuses on the belief that gods and goddesses are present in all things and every element of nature possesses its own power, which reflects the power of the gods. For instance, a rock, tree, or woven cloth is a potential home for spirits whose energy can be directed for good or evil. Pictured here is a Hindu Temple located in Ubud. right beside a Christian Church, an Islamic Mosque, and a Catholic Church. This row of spiritual buildings demonstrates the harmony and accord between the various religions in Bali. 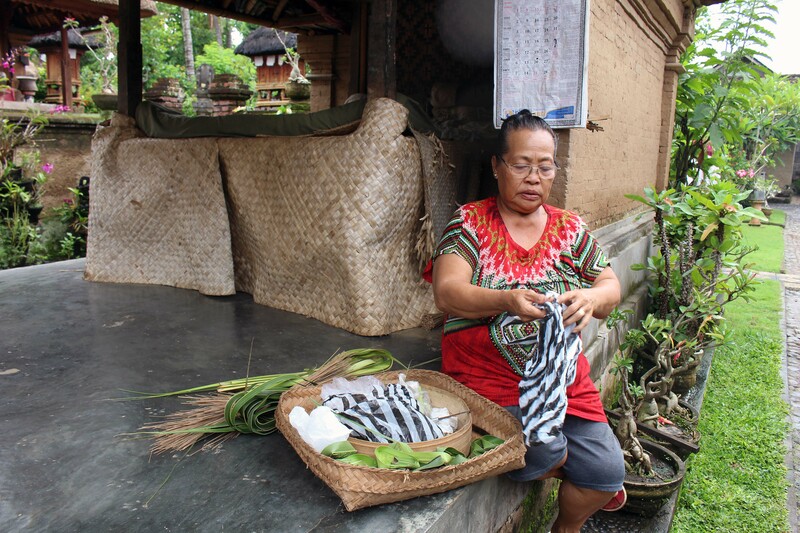 Bali is well known for artists who create handicrafts and fashion, including batik and ikat clothing, wooden carvings, stone carvings, painted art, and silverware. Individual villages are also known for each creating a single product, such as wind chimes or wooden furniture, which is exclusively from that area. This is an example of Indonesian batik design. Batik is a hand-dyed cotton and silk garment with everyday patterns. As of 2009, UNESCO dedicated as an Intangible Cultural Heritage of Humanity. The designs and colors express Indonesian creativity and spirituality. Arabic calligraphy, European bouquets, Chinese phoenixes, Japanese cherry blossoms, and Indian or Persian peacocks influence the wide variety of patterns and designs. Agriculture is considered the most common occupation in Bali, specifically with rice cultivation. Subak is the name of the water management or irrigation system for paddy fields in Bali, developed in the 9th century. The system consists of 5 terraced rice fields and water temples with its own rituals. The water temple rituals promote a harmonious relationship between people and their environment. Rice is seen as the gift of god, and the subak system is part of the temple culture in Bali. As of June 2012, subak was enlisted as a UNESCO World Heritage Site. There are two species of monkey in Bali: crab-eating macaque and Javan Langur. The Crab-eating Macaque is known locally as “kera” and quite common around human settlements and temples. They are commonly found in three “monkey forest” temples, and sometimes kept as pets by locals. The Javan langur, known locally as “lutung,” is rarer of the two. They are born an orange color, and as they grow into an adult their color darkens. Ubud Monkey Forest and Holy Spirit Temple. We observed and interacted with the kera monkeys, feeding them bananas. Balinese Hinduism is deeply interwoven with art and ritual. Balinese performing arts often portray stories from Hindu epics with heavy Balinese influences. Famous Balinese dances include pendet, legong, baris, topeng, barong, gong keybar, and kecak. Kecak Dance performed at Uluwatu with a male chorus based on the Indian epic drama, Ramayana. The Kecak Dance, known as the Ramayana Monkey Chant, is a music drama performed at sunset. 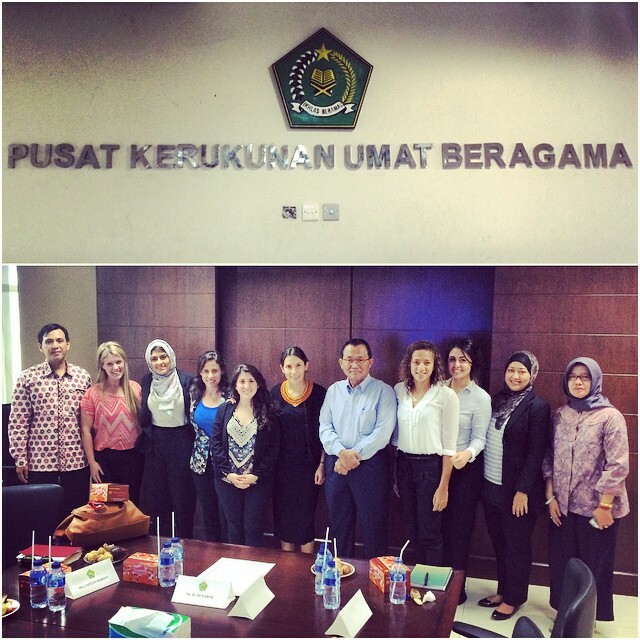 The USC MPD Research Group meets with the Indonesian Ministry of Religious Affairs in Jakarta. Predominantly Muslim Indonesia has played a prominent role in pushing religion into the international public domain in recent years by taking many of the dialogue initiatives at regional and international levels. Although it is the world’s most populous Muslim nation, Islam, however, is not a state religion. The founders of modern Indonesia first proclaimed the philosophical basis of the Indonesian state, the Pancasila, and the religious pluralism that is enshrined in the constitution is a key part of Indonesian identity and constitutional process. This was one of the key points that stood out during our visit at the Ministry of Religious Affairs in Jakarta. The religionization of politics and the politicization of religion, especially in the current environment on the global war on terror, means that increasingly religion plays a role in diplomacy both as an opportunity for engagement and as a motivation inspiring actors. Religion, which until recently was regarded in much of the secular world in the West as essentially the private affair of individuals, is now intruding into the public arena, including the world of diplomacy. As a country with a pluralistic society and proud of its rich cultural and religious diversity, religious leaders play important roles in their communities in shaping attitudes and people’s understanding of the world around them. Concerns about interfaith relations grew with the polarization of the world along Samuel Huntington’s Clash of Civilization line, in the wake of the 2001 terrorist attacks in the United States. While the tradition of interfaith dialogue has long existed in pluralistic Indonesia for decades, the government has taken the initiative to bring this tradition to the international level and, lo and behold, has found receptive audiences since 2002. The involvement of religious communities in Indonesian public diplomacy is very dominant in interfaith dialogue program. This program is an integrated part of Indonesia’s Total Diplomacy, under the former Indonesian Foreign Affairs Minister, Hassan Wirajuda, which is practiced by the Ministry of Foreign Affairs. Wirajuda’s Total Diplomacy concept involved all components of society and is defined as a diplomacy that is more inclusive and comprehensive on every issue, which involves all nation state components. Engagement with the religious communities in interfaith dialogue is no longer exclusively under the purview of the Ministry of Religious Affairs, but a concerted effort together between both Ministry of Religious Affairs and Ministry of Foreign Affairs. The interfaith dialogue promotes values of pluralism, multiculturalism and religious harmony in Indonesia. Islam in Indonesia was developed through a process that still upheld the local values and local wisdom, or what is called the “indigenization of Islam”. This particular process makes Islam in Indonesia unique from the practice of it in other regions. Considering the fact that Indonesia is one of the world’s most diverse countries, diversity is the central feature of Indonesian culture with 300 ethnic groups; 750 languages and dialects the importance of diversity is embedded in the nation’s motto: Bhinneka Tunggal Ika, which translates to Unity in Diversity. Although the country is predominantly Muslim, the government officially recognizes six religions – Islam, Christian Protestants, Roman Catholics, Hinduism, Buddhism, and Confucianism. The rise of globalization, multi-track diplomacy and terrorism as a threat for world peace and security has influenced the Indonesian government to engage religious communities in interfaith dialogue program in Indonesian public diplomacy. Every country cannot ignore the globalization phenomenon and its impact on the social, political, and cultural life of its people. In an age of globalization, religion has become an important issue of global politics. The worldwide resurgence of religion has influenced changes in the political life. In this respect, the complex interdependence between religion and globalization is reflected in how the role of religious actors as a non-state actor in diplomacy is more important. This can be seen in Indonesia’s involvement and engagement with religious actors from religious communities in its public diplomacy. In a country where religion is important, the multi-track diplomacy with the focus on peace making through faith in action embodies Indonesian faith diplomacy efforts and at its core is the interfaith dialogue programs. The interfaith dialogue program in Indonesian faith diplomacy emphasizes the important role of religious communities in diplomacy. In the past, impact of individual and non-governmental organizations in international affairs might not be as impactful as the states, intergovernmental organizations or multinational corporations. This is not true in the present situation. In the context of the Indonesian religious community, the role of Muhammadiyah, Nahdlatul Ulama, Bishop Conference of Indonesia, Communion of Churches in Indonesia in interfaith activities perform the role of (religious) NGO and religious leader, as an individual, has increased their role in international relations. Indonesia continues to promote inter-cultural and inter-religious dialogue to create tolerance, mutual understanding and respect among religious community. As a country with a pluralistic society and proud of its rich cultural and religious diversity, Indonesia continues to promote inter-cultural and inter-religious dialogue to create tolerance, mutual understanding and respect among religious community. The role of religion and religious affairs in influencing its foreign policy is becoming more prominent. At the heart of it, the Indonesian government’s effort to include religious communities in its foreign policy strategy, specifically the interfaith dialogue in diplomacy, is a soft power package where it can brand itself as a country practicing moderate Islam while promoting the moderate groups in counter terrorism to action. If anything else, it could be seen as “hip” to befriend Indonesia: A good friend of the West, the East, the Muslims and a country cognizant of the need for cultural harmony, environmental sustainability and social inclusiveness. The world sees Indonesia in a positive light. World leaders like Obama, Cameron, Merkel, Erdogan, Ferdinand de Kirchner, Abe, and Lee perceive Indonesia as a partner. Indonesia’s influence is spreading to the Americas, Europe, Africa and Central Asia. In fact, countries large and small have received the same respect from Indonesia as partners for global stability, peace and prosperity. Hence, it becomes even more critical for Indonesia to take advantage of this positive momentum, standing at the right time in history to play a global role as Indonesia approaches its centenary. The USC MPD Research Group meets with the Counter-Trafficking and Labour Migration Department of the International Organization of Migration Indonesia office in Jakarta. There is a difference between hearing and listening. Even within the field of public diplomacy there is a difference between listening and active listening. Much of our research experience thus far has been to observe how well each organization with which we meet are hearing partners, communities, publics and other governments. As one of the key components to effective public diplomacy, it seems the International Organization for Migration in Jakarta is a prime example of what it means to truly listen. IOM is an intergovernmental organization funded by the Indonesian Ministry of Foreign Affairs, whose main objective is to promote order in migration. A massive transit country for migrants, IOM Indonesia is one of the overall organization’s top priorities. 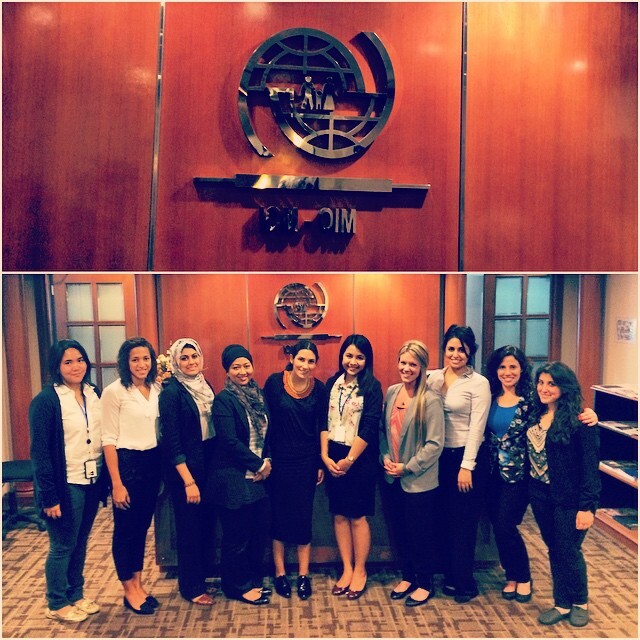 Our visit with IOM Jakarta was time well-spent learning from the Human Trafficking and Labour Migration department about current projects and programs they have developed. Everything from regions of the world with which they work to digital engagement to education through human trafficking-themed comic books and documentaries, IOM seems at first glance to be practicing effective public diplomacy in most aspects. What stood out most was how in tune they are with local communities and current issues with which they are dealing, especially partnerships formed with grassroots organizations and local NGOs. Through these partnerships they mentioned a number of ways in which they are utilizing their relationships to gain even more expertise and understanding on the ground. As an organization as big and multi-faceted as IOM, with more than 480 field locations worldwide, the importance of partnerships becomes even more vital in order to listen from the bottom up, to obtain and maintain the diverse wealth of knowledge for an organization such as IOM, and thus be more engaged and uphold effective public diplomacy. Human trafficking within and outside of Indonesia is a convoluted and complex issue in and of itself, and IOM appears to be doing an incredible job in terms of its structure and individualized programs, with a multi-faceted approach. We look forward to implementing IOM Indonesia as a case study demonstrating effective strategies in partnership development within our final research report. Through this meeting we saw just how important and effective strengthened relationships between like-minded organizations really can be. Thanks to organizations like IOM, victims of human trafficking throughout the world really are being helped and heard. 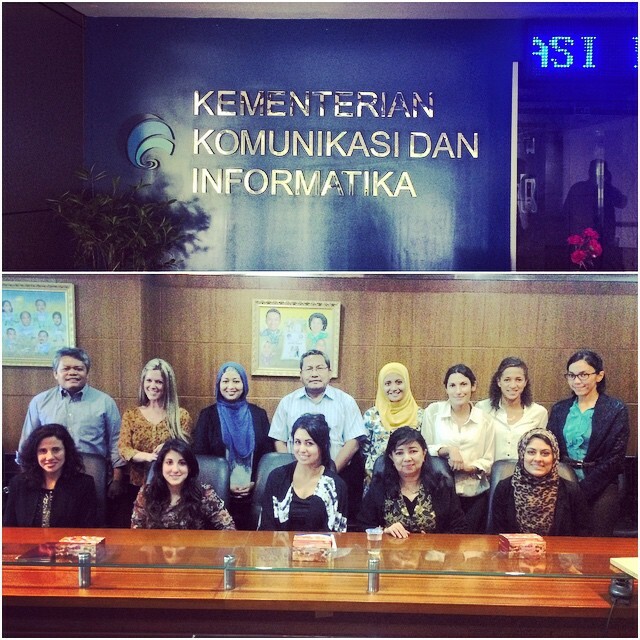 The USC MPD Research Group meets with the Indonesian Ministry of Information and Communication Technology in Jakarta. Freedom is often regarded as an absolute concept. There is no compromise of addendum to freedom. It is a core principle to democracy and defended around the world. During our time in Indonesia we have been introduced to an incredibly diverse country were the principles of tolerance, prosperity, and freedom permeate every aspect of its foreign policy. As the world continues to become more globalized individuals’ rights to freedom of expression extend to the digital realm. Internet Freedom, defined by The U.S. Department of State, is the “access to the global Internet as an open platform on which to innovate, learn, organize and express [oneself] freely from undue interference or censorship.”  Indonesian Cyberlaw No. 11/2008 concerning electronic transactions gives Indonesians the right to access information on the Internet, and freedom of expression online. These rights should and will be upheld, but not at the cost of someone else’s freedoms. This nuanced but important distinction is indicative of the diversity present in the Indonesian population and its collectivistic society. Individual rights are important and defended by the Indonesian constitution, but not to the detriment of someone else’s rights. During our meeting with the Ministry of Information and Communication Technology we learned about a recent effort to block all pornographic content online. Although at first glance it seemingly does not fit with the absolute meaning of freedom it is indicative of the ethnic and religious diversity present in Indonesia. As the United States continues to advance Internet Freedom as a foreign policy priority it will be interesting to see how it deals with the cultural sensitivities present within Indonesia. 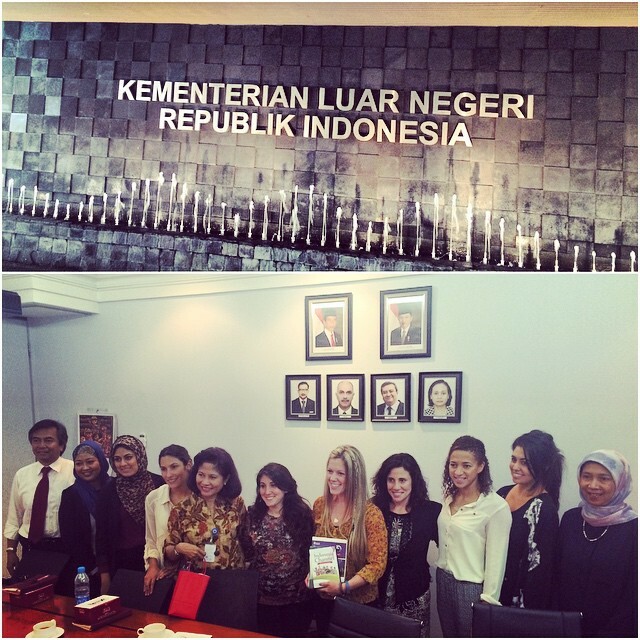 The USC MPD Research Group meets with the Indonesian Ministry of Foreign Affairs in Jakarta. After some well-deserved and much needed rest we headed out for the first appointment of our second day of meetings at the Ministry of Foreign Affairs. Upon our arrival, we were joined by Ambassador Esti Andayani, Directorate General of Information and Public Diplomacy Al Busyra Basnur and their staff. The Ambassador began our meeting by emphasizing the importance of their relationship with the US. With 1 embassy, 6 consulate generals and a mission to the UN in New York, Indonesia seeks to continue having positive relations with the US. Indonesia sees the US as a strategic partner in many areas, specifically education. With 7,600 Indonesia students studying in the US (1,600 in Los Angeles and 172 at the University of Southern California) and 500 US students in Indonesia, the emerging nation wishes to continue its partnership with the US by encouraging more students to come study in Indonesia through exchange programs. The main focus of our meeting was a presentation in Indonesian foreign policy and diplomacy. Part history lesson, part strategy explanation, we were guided through the 4 post-independence presidential eras. President Soekarno – father of the nation and defender of the developing world, President Soeharto – father of development and promoter of modern Indonesia and unity in diversity, President Yudhayano – advocate of total diplomacy and regional cooperation, and President Jokowi – believer of Trisakti, which encompasses maritime, economic and down to earth diplomacy. The concept of down to earth diplomacy is an interesting term that came up during our discussion, highlighting the idea that instead of public diplomacy being abstract and unattainable, the Ministry of Foreign Affairs is attempting to bring diplomacy down to a relatable, grassroots, people-to-people level. Structurally, it was described as Track Three Diplomacy, meaning it is conducted on an individual level. It is interesting to consider both the domestic and international context in which each presidency took place. Moving forward as Indonesia stands as a leader of the developing world, the new president will have to balance the desire for domestic well-being and prosperity within the international economy through his foreign policy and diplomacy agenda. 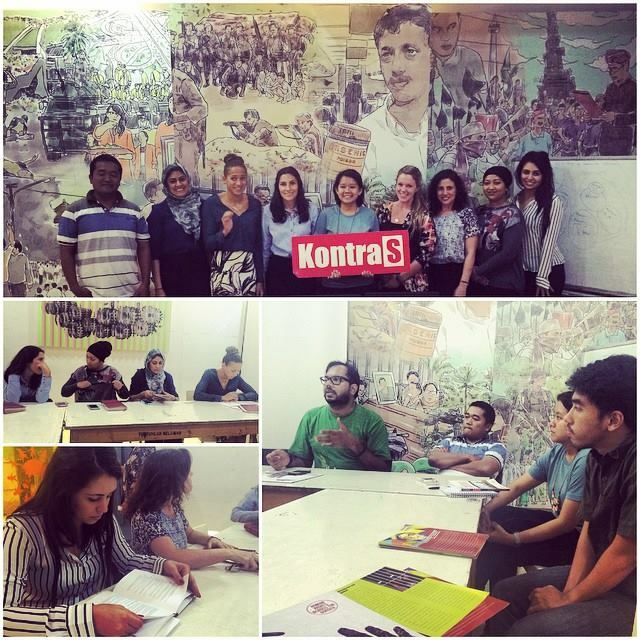 The USC MPD Research Group visits Human Rights NGO Kontras in Jakarta, Indonesia. Human rights NGOs, as non-state actors, work to protect and support the world’s most vulnerable populations. They give a voice to those that are oppressed and not being sufficiently heard among local and global audiences. When NGOs increase their use of public diplomacy, they amplify the voices of communities that have experienced human rights violations so they reach the ears of those who have the power to create change. In the end, this holds governments more accountable for respecting human lives and dignity when making political and economic decisions. A visit to the NGO KontraS gave our team a look at how Indonesian non-state actors use public diplomacy in an era of internet connectivity and globalization. Founded 17 years ago at the end of the Suharto regime, KontraS, originally “addressed issues of state-sponsored abductions and enforced disappearances.” Today the organization is a leader in “dismantling the use of violence and defending human rights” in Indonesia, as well as in other nations around the world. KontraS’s staff gave us a first-hand look into how the NGO both speaks as an independent entity monitoring government actions, as well as an ally to governments that count on them for human rights expertise. This delicate balancing act is one that is shared by human rights monitoring groups all over the world. 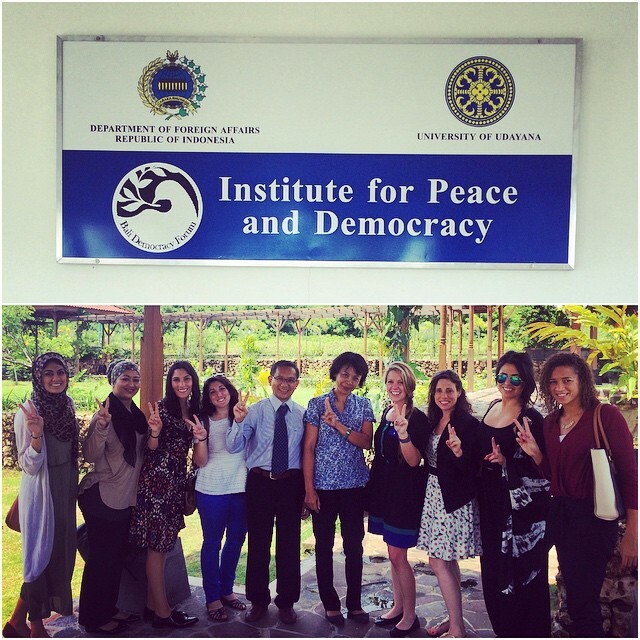 So, KontraS exchanges knowledge and resources with international human rights groups. This strengthens KontraS and gives global NGOs promoting human rights an opportunity to learn from one another and enhance the impact of their important work throughout the globe. For example, Las Madres de Plaza de Mayo, “an Argentine association of mothers whose children were ‘disappeared’ during the Dirty War of Argentina’s military dictatorship,” has traveled to Indonesia to meet with KontraS. KontraS works with Indonesian families whose loved ones “disappeared” prior to the fall of the Suharto regime. While the histories and cultures of Indonesia and Argentina are vastly different, these NGOs find that there is overlap where they find common experience and goals. Ultimately, when they exchange best practices and expertise, they can learn from each other and better protect human rights in both countries. KontraS boosts its international engagement, resource development and policy change opportunities through its presence on social media. They have more than 54,000 followers on Twitter, where they communicate with international publics about abolishing the death penalty, stopping land grabs and protecting rights to free expression. Still, it appears that KontraS’s social media efforts have much room to grow before they truly maximize results for the organization. The question is: What keeps KontraS from fully utilizing social media, and what can be done to enable them to take more advantage of the benefits of new technologies?” Our team’s upcoming report will address these issues and provide recommendations that KontraS and other NGOs and non-state actors can consider to make the most of what social media engagement can accomplish. Nelson Mandela said, “To deny people their human rights is to challenge their very humanity.” Public diplomacy practitioners now have more opportunity than ever before to uphold that humanity via NGOs and other non-state actors.